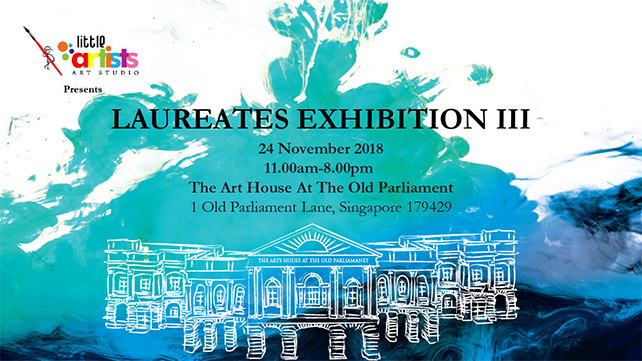 Held at The Arts House at Old Parliament, The LAUREATES Exhibition is on Saturday 24th November, 2018 from 11am-8pm. This group exhibition of original works features nearly 300 young emerging artists of incredible ability studying at Little Artists, aged 3yrs-17yrs as well as adults. Displaying highly expressive styles and a wide range of techniques and mediums, LAUREATES Artists are aptly named. Nearly 300 pieces will be shown across The Arts House, including, paintings, sketches, sculptures, digital media works, and mixed media works. Pieces explore unconventional, classic and contemporary methods; subjects range widely from fantasy to portraits, from rich landscapes to vibrant 3D works. Each artist spent weeks and months creating their pieces, drawing inspiration from their immediate surroundings and memories, as well as their dreams and deeper realms of their emotions. This is the final in a three-part LAUREATES Exhibition series celebrating Little Artists’ 20th Anniversary that began from 2nd-3rd September, 2017 with the inaugural exhibition at National Gallery Singapore. The second show was at the Visual Arts Centre from 20th – 23rd September, 2018. The final show in the series is the upcoming one at The Arts House at Old Parliament on 24th November 2018.